Performance by the Natural Sound Workshop, under the direction of Kirk Nurock, of experimental musical improvisations at WBAI's Free Music Store on January 10, 1973. The pieces performed are all group performances unless otherwise indicated: "Sounds in space"; "Rhythm chant"; "Solos" with Bard Klahr and Thomas Giles; "Passing"; performer Gershon Freidlin (appearing by permission of the Sebastoon Foundation); "Alice" by Bryant Hayes (text by Lewis Carroll); "SoundsInduced and Altered;Night" by Kirk Nurock; "Untitled" by Matty O'Hare; "Un chem de la vrie" by Steve Margoshes ("Dafeldeuk" language created by Steve Margoshes); Gershon Freidlin; and "Sounds with audience." This performance was recorded in stereo by David Rapkin and produced by Candy Cohen for WBAI's Music Department. 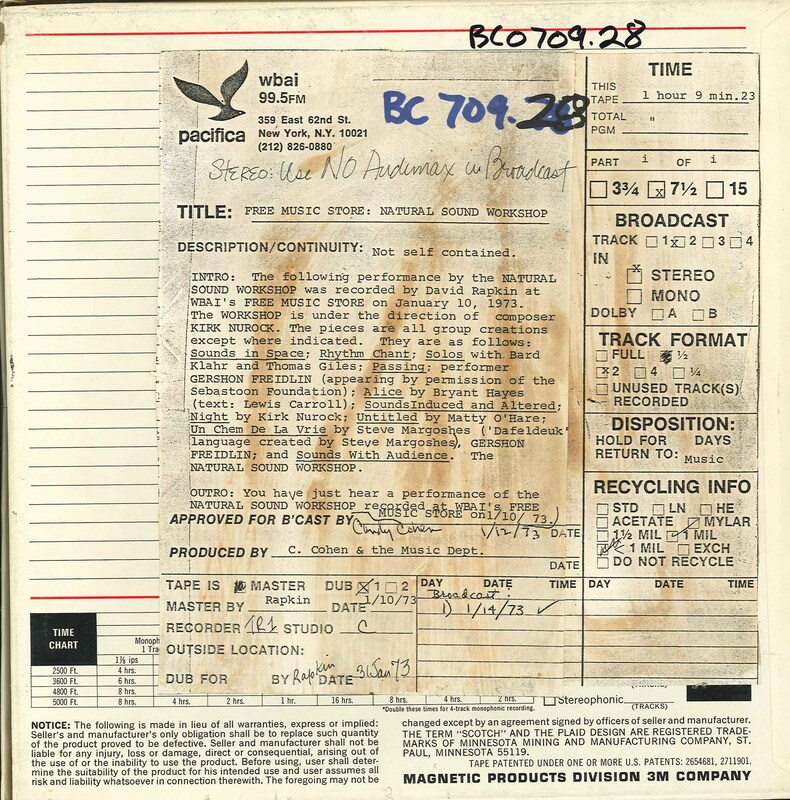 This recording was formerly cataloged as BC0709.28. 1 reel (70 min.) : 7 1/2 ips, mono. Los Angeles : Pacifica Radio Archive, 1973.